Little Clipper is the lighter, smaller version of it's big brother (Big Clipper). Clipping is one of the more misunderstood processes in mixing. When used correctly, it can make mixing easier. Things just fall into place better and dynamics stay under control. As it is with all effects however, it's easy to overdo. Little Clipper is the lighter, smaller version of it's big brother (Big Clipper). Clipping is one of the more misunderstood processes in mixing. When used correctly, it can make mixing easier. Things just fall into place better and dynamics stay under control. As it is with all effects however, it's easy to overdo. 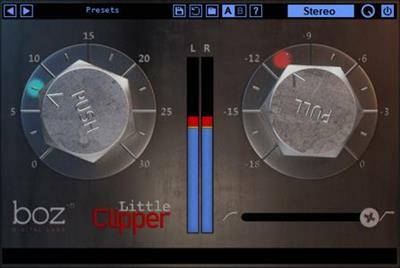 Little Clipper makes it easy to dial in with clear meters that show you how much clipping is occurring, and all the essential features that let you dial in your clipping to be just the right amount. Just like all effects, clipping is bad when you do it accidentally. When used purposefully, it's a powerful tool that that can be used to increase your apparent dynamics without making your peaks jump all over the place. It's especially powerful on drums. Just a little bit of clipping your snare before your compressor will give your compressor much more natural sounding, predictable results.